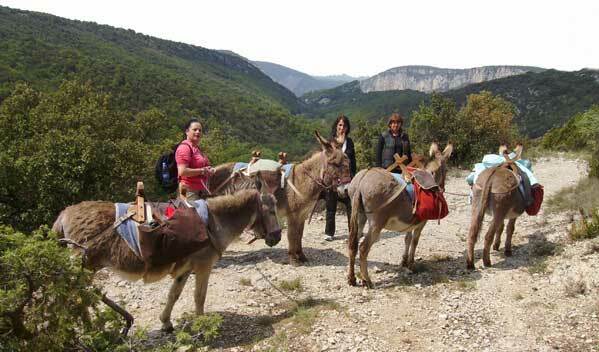 Go on an adventure on our beautiful ways of the Ardeche Gorge. For a day in the hills .. In the heart of "les Gorges de l'Ardèche", far from the crowds, in beautiful and peaceful surroundings. You will feel the emotions of a people who lived here long ago, from prehistorically times to nowadays. Many rock shelters or caves can be found along the track. Every day is of 10 to 15 km, with possible stops. Camping at the local farm – advance booked accommodation - hotels . Walk along peacefully,the donkey will follow your own rhythm. This will help your contact with the inhabitants and also motivates your children to walk along. Donkeys are sensitive, cuddling and adapt themselves well to your rhythm. Families and groups welcome.